NCT has extensive knowledge and training in the field of robotics. We have installed and set up over 100 different robotic systems for a variety of applications. The majority of these systems have been ABB, Fanuc and Epson robots. The robots are often integrated into a PLC system that has control over the robot movements. We have also set up robots integrated to a camera system that instructs robot positions. If you think about a robot application, we can provide the expertise. For any questions regarding robotics please contact our experts. NCT specializes in ABB applications. Our employees have been trained at ABB in Detroit for programming and maintenance and have experience in setting up and teaching ABB robots for parts handling. We have mainly used controller versions S4 and IRC5. Even if most of our applications are for ABB robots we can implement almost any robot brand desired by the customer. Most of our robot applications have been for the automotive and aerospace industry. We have installed about 30 ABB robots locally. Most of these have been 2400s and 140s for parts handling. However, we do have experience with many other applications for robots. If you have questions about robot applications or want to discuss a possible project please contact our main robotics technician with the link above. 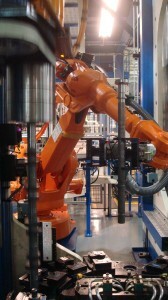 NCT has experience with installing and setting up pick and place epson robots. Generally, these robots have been directly attached to a machine for assembly purposes and not on its own as with our ABBs. NCT has experience with installing and setting up pick and place Fanuc robots. Generally, these robots have been directly attached to a machine for assembly purposes and not on its own as with our ABBs.